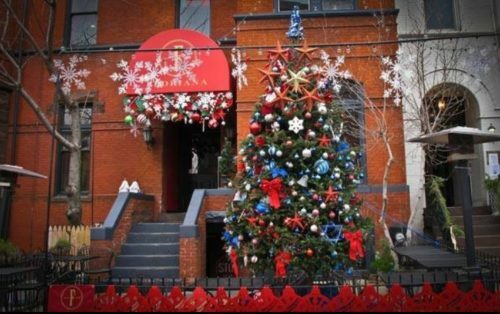 Representative Nancy Pelosi (D-CA) visited a restaurant in DC’s Dupont Circle to see the Christmas tree erected in honor of the record number of women elected to federal office this year. The 17 feet tall tree honored all the women elected to Congress this year. All their names are displayed in red, white, and blue ribbons on the tree. But a three foot cutout of the Minority Leader is the topper. And on Friday, Pelosi herself went to see the tree. The Washington Blade reports that a small crowd gathered in the restaurant as word spread of the unannounced visit. She spent an hour talking about the history of LGBTQ issues in Congress, regaling the crowd. “We are all God’s children, and that includes gay people,” Pelosi said, explaining her support for LGBTQ equality in the terms of her Christianity. And she was able to bring funding for HIV and AIDS back to her constituents. Later, she would help Cleve Jones get the National Park Service to allow the NAMES Project to unfurl the AIDS Memorial Quilt on the National Mall. In the 1990’s, she voted against the Defense of Marriage Act, which was a then-popular bill that banned federal recognition of marriage equality. “I rise in strong opposition to this ill-named ‘Defense of Marriage Act’ and I do so on the basis of conscience, Constitution and constituency,” she said at the time. And she would later help pass a bill that repealed Don’t Ask Don’t Tell, the policy that banned gay people from openly working in the military. Pelosi, who is likely to be Speaker of the House next year, has already promised that a ban on LGBTQ discrimination would be a top priority for Democrats. “Alright boys, it’s been lovely. But I have to get to my day job,” she said at the end of her visit to Floriana. “She had a ball,” her press office said.